Home/Posts/Why do pupils who went to infant and first schools appear to underperform at Key Stage 4? As a principle, most of us would agree that the way education is organised in any given part of the country should not have an impact on the educational outcomes of children. Most pupils will go to primary school at age four, then transfer to secondary school at age 11. They will be assessed at Key Stage 1 and Key Stage 2 in the same school. A small proportion of pupils will change schools between Key Stage 1 and Key Stage 2. This might involve moving from an infant school to a junior school at seven (often on the same site or even in the same building) before transferring to secondary school at 11. And some parts of the country have retained a “three-tier” system where pupils join a first school at four, before moving to middle school at eight or nine and then to high school at 12 or 13. Around 10% of state-funded schools with Key Stage 1 classes are infant or first schools. Numbers of these schools have fallen by 1,000 over the last 10 years to around 1,700 today. 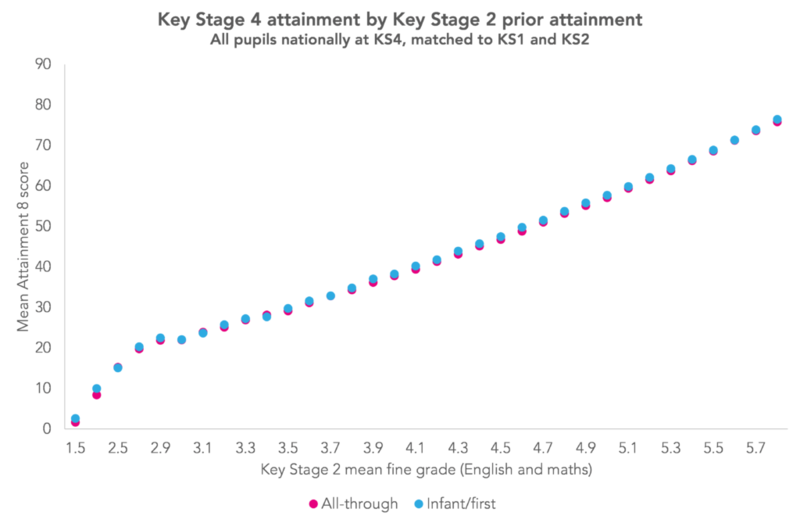 So is there any difference in subsequent Key Stage 4 attainment between those who went to infant/first schools and those who went to all-through primary schools? The chart below shows that those who completed Key Stage 1 in an infant or first school tended to achieve lower Attainment 8 scores than those with the same KS1 attainment from an all-through primary. 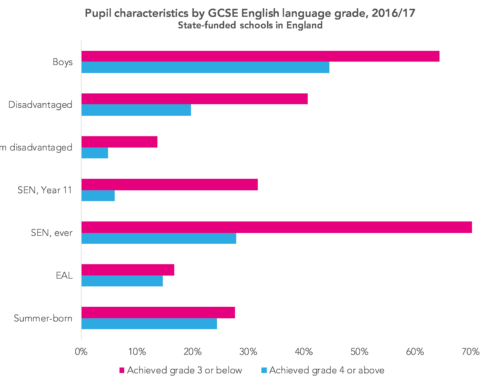 For each prior attainment group, the gap was around 2-3 points, equivalent to 2-3 grades across the total 10 subjects counted in Attainment 8 (English and maths are double-weighted). Yet the overall average score for pupils from infant/first schools was 49.2 – only slightly higher than the average of 48.9 for all-through primary schools. 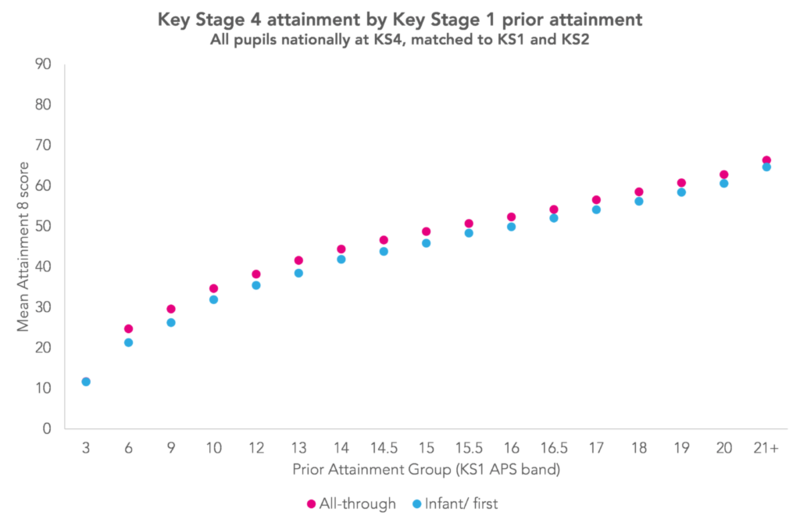 In other words, average Key Stage 4 outcomes for pupils who went to an infant/first school are similar to those for pupils who went to an all-through primary. But pupils assessed at Key Stage 1 in infant/first schools tended to have higher levels of prior attainment. A total of 13% had a Key Stage 1 average point score (APS) of 21 or higher (Level 3 or higher), compared to 8% in all-through primaries. Conversely, just 10% had an APS of 10 or lower (just above Level 1), compared to 15% in primaries. The chart below shows the full picture. Based on an areal measure of disadvantage at age seven, the Income Deprivation Affecting Children Index (IDACI), however, there appears to be no difference in mean KS4 outcomes for pupils in infant/first schools and all-through primaries. 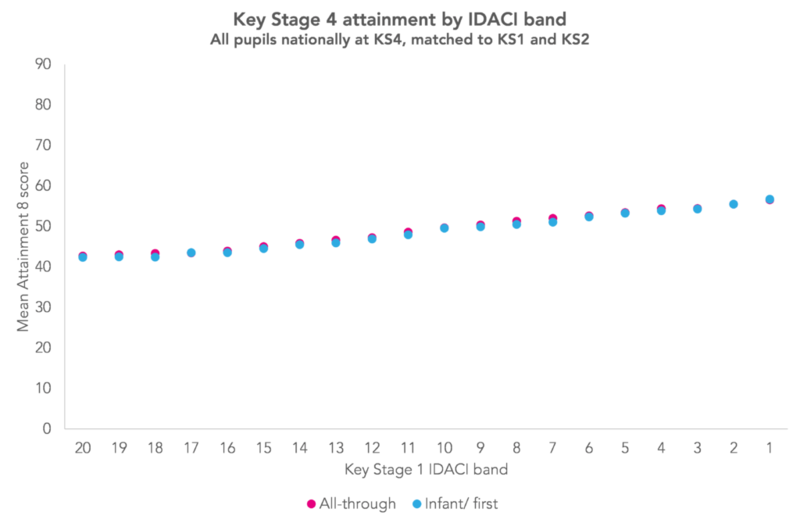 In the chart below pupils are divided into 20 evenly-sized bands based on the IDACI score of the area in which they live. 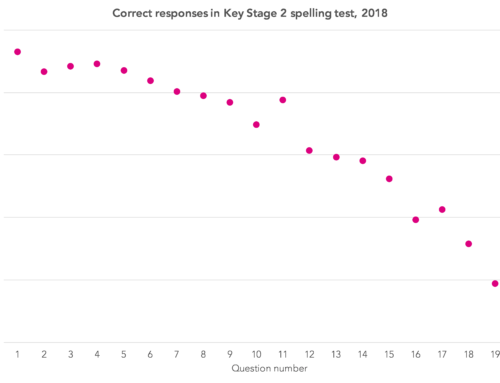 The dots form a straighter line than those based on KS1 APS above, indicating that IDACI is less predictive of KS4 attainment than KS1 performance. In the same way, pupils from infant/first schools tended to achieve similar Attainment 8 scores to pupils from all-through primaries when KS2 prior attainment is considered, as the next chart shows. Of course, none of this will be news to junior and middle schools. 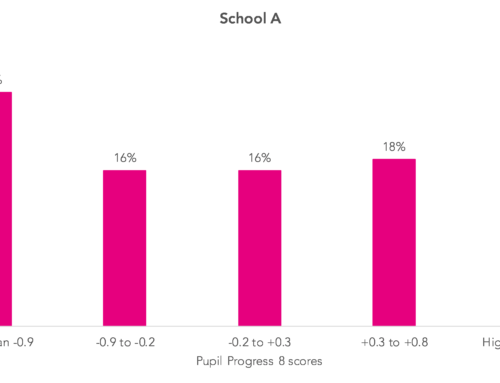 On the surface, pupils from infant and first schools appear to underperform at KS2 as well. 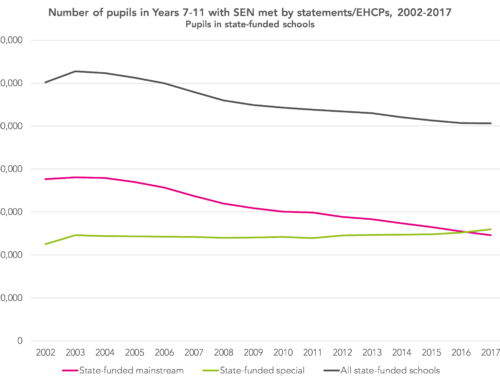 Whether this is because primary schools depress KS1 baselines or infant/first schools inflate them (or perhaps there is a bit of both) is something we have written about before. On average, pupils in all-through primary schools, covering both KS1 and KS2, achieve one scaled point more in both reading and maths at KS2 compared to their counterparts in junior/middle schools, as the table below shows. 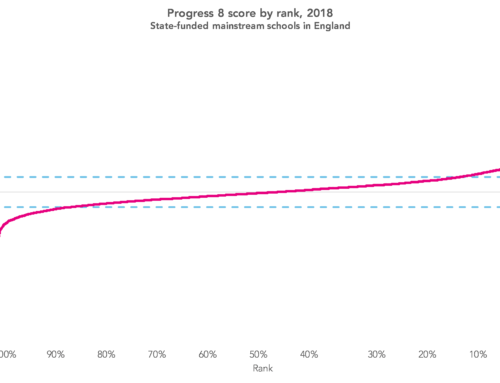 The difference reduces by more than a half if results from the Foundation Stage are used as the baseline for KS2 value added scores, as we wrote here. All of this does tend to support a view that Key Stage 1 attainment of pupils from infant/first schools should, on average, be similar to that of those from all-through primaries. And the apparent underperformance at KS4 of pupils who had attended infant/first schools is most likely just another facet of this, as opposed to actual underperformance at KS4. Calculate separate KS1-KS2 value added measures for junior/middle and all-through primary schools. Want to stay up-to-date with the latest research from Education Datalab? Sign up to Datalab’s mailing list to get notifications about new blogposts, or to receive the team’s half-termly newsletter. Really interesting approach. Can I check I haven’t misunderstood or misread one thing? 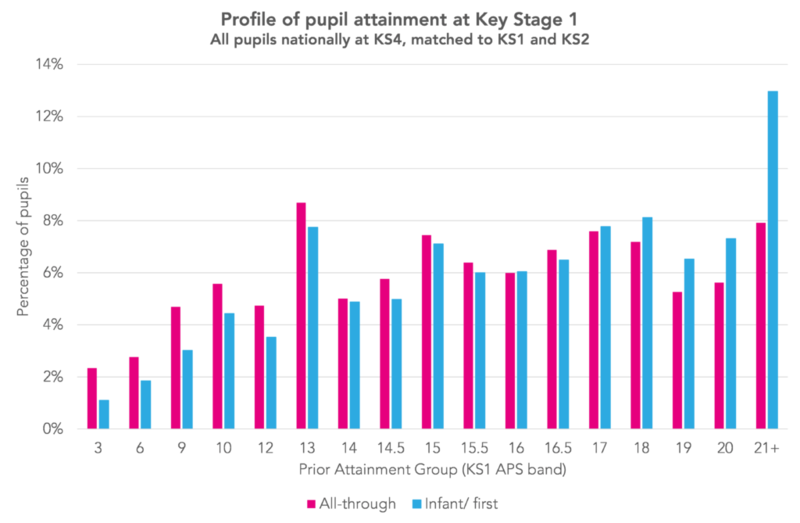 Under the first chart, it says outcomes at KS4 were higher from infant/First Schools than all through (albeit they were similar). Rest of the article suggests not. Hi Kate. Yes, so attainment by the end of KS4 is very slightly higher among pupils who went to infant/ first schools. However, if you look at KS4 attainment given pupils’ KS1 assessments it appears that pupils from infant/ schools don’t do quite as well as pupils from all-through primary schools with similar KS1 attainment. Thanks Dave. So could it be that children actually do slightly better in infant/First Schools, and that this works through by KS4, but the crude bandings for KS1 attainment mean that some leave with inflated KS1 assessments which can’t be lived up to by the end of KS2?